Maya's favorite thing was doing Random Acts of Kindness for others! 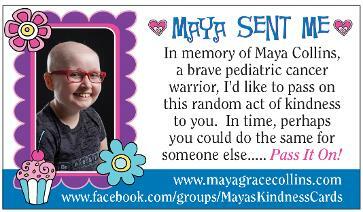 In Maya's memory, we have designed Maya's Kindness Cards. Download these cards, cut them out, and pass them on! We are including links to two different files, one has crop marks/bleeds, the other doesn't. Please use the version that you prefer. We just ask that you print these off on durable card stock so these cards can be passed on and "paid forward" multiple times. These cards are only one-sided, whereas the cards that we can print for you below are printed front and back. See below for more info on ordering. Please allow 6-10 business days for shipping and they will be shipped directly to you.